From Arcadia Publishing. Released 2005. York has been America’s historic crossroads since the town was laid out in 1741. From 1777 through 1778, it was the seat of American government from which the Second Continental Congress led the fledgling nation. Less than a century later, York became the largest northern town occupied by the Confederate army. Gilded Age prosperity created a vibrant and growing town throughout the first half of the twentieth century. 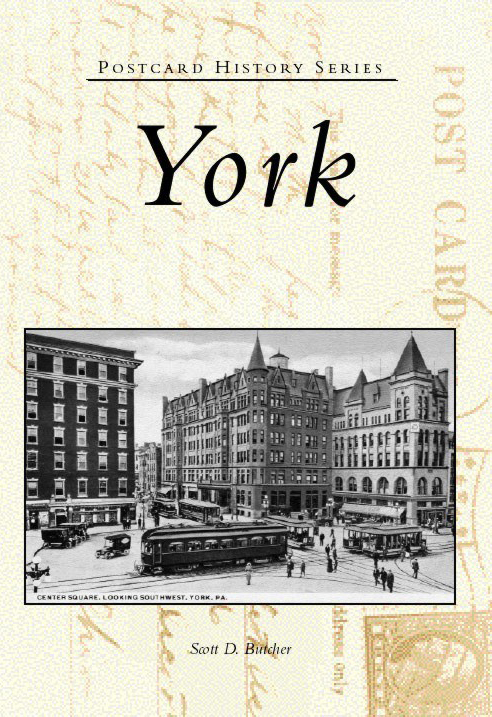 York showcases this period with a unique collection of vintage postcards. Travel back to an era of trolley cars, five-and-dimes, downtown department stores, and high-style buildings that all helped to define this dynamic community. Purchase York (Postcard History Series). "What sets this book apart, when compared with the many other local history books on the market, is the photocentric way in which the history is presented. What’s also unique is the book’s focus on what Butcher considers to be an overlooked period in York, which is the early-to-mid-20thcentury. There is no single storyline to follow. Under each postcard is a caption highlighting the moment captured in the photo." Copyright 2010 Scott D. Butcher. All rights reserved.